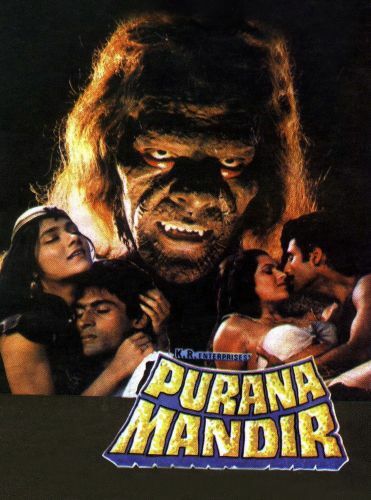 Anyone interested in finding the meeting point between classic horror cinema and Bollywood filmmaking would do well to see Purana Mandir. Directors Tulsi and Shyam Ramsay had made several horror films prior to Purana Mandir but this was their buggest success, the film that defined their take on the genre. If viewed through the eyes of a Bollywood filmgoer, it makes perfect sense: in Purana Mandir, the Ramsays create a colorful hybrid that is uniquely tailored to their market's needs. The storyline provides many a scare and an iconic horror villain while also attending to the audience's expectations by delivering romance, strong pro-family and pro-religion messages, comic relief and several song-and-dance numbers. The end result is curious but fascinating. On one hand, the tonal shifts are abrupt enough to cause whiplash, the film meanders during its middle third due to a few too many plot digressions and the comic relief is so localized in style and content that it will baffle viewers from other countries. On the other hand, the experience is never dull: Purana Mandir sustains its lengthy running time by cramming two or three films' worth of incidents into one plotline and delivering some sort of spectacle --a song & dance number, a scare sequence or even a kung-fu fight - into every reel of the film. It's also worth noting that when the Ramsay Brothers focus on the horror aspect of the film, the proceedings are quite engaging: the scare setpieces deploy a combination of flashy camerawork, frenetic editing and nerve-jangling sound effects that hit and sustains a mood of over-the-top gothic horror intensity. Finally (and most importantly), Ajay Agarwai delivers an intense, highly charismatic turn as Saamri that gives the film an unforgettable villain. In short, Purana Mandir might not hit the target for all viewers but adventurous fans of cult movies will find plenty to keep their eyes and ears engaged with this one-of-a-kind masala horror epic.